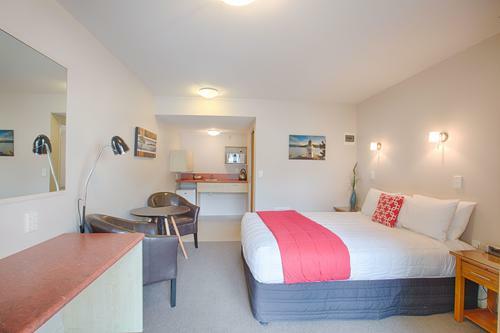 This is a west facing compact hotel style studio with a queen size bed. The private bathroom has a shower, W.C, hair dryer, heated towel rail, along with fresh towels provided daily. The studio includes cutlery and crockery to prepare a light meal or breakfast. Also, there is a fridge, small microwave, toaster, and complementary tea/coffee/hot chocolate, along with a hot water kettle. Ironing facilities, alarm clock / radio, LCD TV & DVD Player, electric heater, telephone and unlimited, multi device wifi is also provided. For the cooler nights there is a dual control electric blanket on the bed and a NZ pure wool blanket available for extra warmth. Includes free, multi device wifi. Central Village Accommodation. An easy access studio with a queen size bed. This studio is ground level with views towards the peaks of the Glacier Valley. Parking is available directly in front of your studio. The private bathroom has an wet floor access shower with full shower curtain. 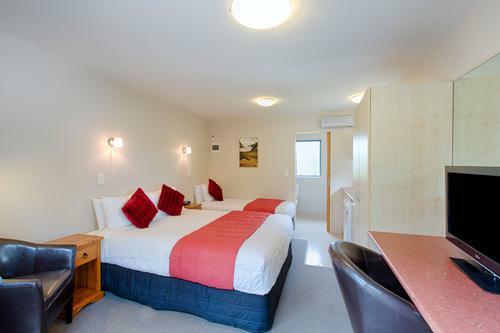 W.C, hair dryer, heated towel rail, along with fresh towels provided daily. The studio includes a kitchenette which includes cutlery, crockery, microwave and electric fry pan. Also, there is a fridge, toaster, and complementary tea/coffee/hot chocolate, along with a hot water kettle. Ironing facilities, alarm clock / radio, LCD TV & DVD Player, electric heater, telephone and Free multi device WiFi is also provided. For the cooler nights there is a dual control electric blanket on the bed and a NZ pure wool blanket available for extra warmth. Suitable for 1 - 3 people. Our more private Twin Studio provide a queen and single bed. This is ideal if you are wanting two separate beds or if you are a couple traveling with a child. The private bathroom has a shower, W.C, hair dryer, heated towel rail, along with fresh towels provided daily. The studio includes a kitchenette which includes cutlery and crockery microwave and electric fry pan. Also, there is a fridge, toaster, and complementary tea/coffee/hot chocolate, along with a hot water kettle. Ironing facilities, alarm clock / radio, LCD TV & DVD Player, electric heater, telephone and Free Multi Device Wi-fi is also provided. For the cooler nights there is a dual control electric blanket on both beds and two NZ pure wool blanket available for extra warmth. Queen size bed and single bed. Suitable for 1 - 2 persons. An upstairs studio with a king size bed. Offering an unbroken view towards the impressive Fritz range and its many small glaciers, including the Croz glacier. The Franz Josef Glacier is just over the bush lined horizon. The private bathroom has a shower, W.C, hair dryer, heated towel rail, along with fresh towels provided daily. The studio includes a kitchenette which includes cutlery and crockery microwave and electric fry pan. Also there is a fridge, toaster, and complementary tea/coffee/hot chocolate, along with a hot water kettle. 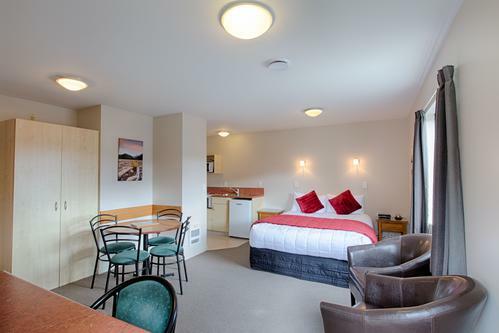 Ironing facilities, alarm clock / radio, LCD TV, electric heater, telephone and Free Multi Device Wi-fi is also provided. For the cooler nights there is a dual control electric blanket on the bed and a NZ pure wool blanket available for extra warmth. Suitable for 1 - 4 people. 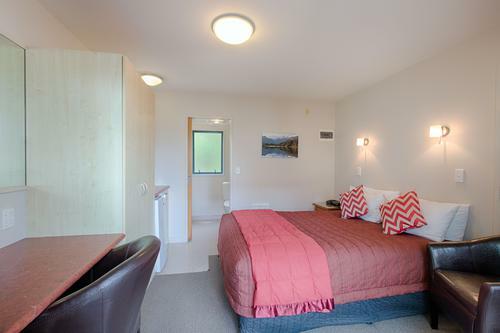 A one bedroom unit which has a queen size bed in the living area and two single beds in the bedroom. The living area has a dinning table, desk and chairs. 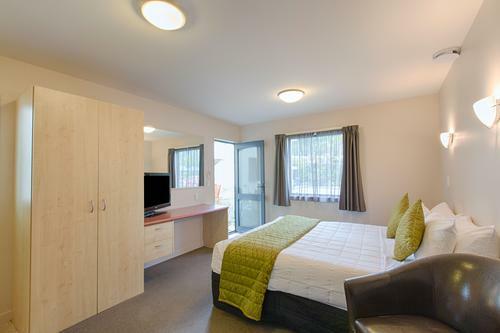 Our One Bedroom Family Units are the ideal family accommodation for up to 4 people. Our family units are approximately double the size of a Standard Studio. The facilities in a Family Unit include: A bathroom with a single four jet spa bath with a shower above. The full kitchen includes cutlery and crockery, a bench top oven with two hot plates, microwave, and cooking utensils. Also there is a fridge, toaster, and complementary tea/coffee/hot chocolate, along with a hot water kettle. Ironing facilities, alarm clock / radio, LCD TV & DVD Player, electric heater, telephone and Free Multi Device Wi-fi is also provided. 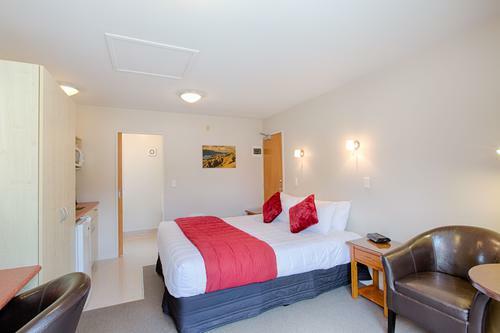 For the cooler nights there are electric blankets on the beds and extra heater in the bedroom and NZ pure wool blankets available for extra warmth. Queen Bed in living area with 2 singles in a separate bedroom. Full Kitchen. Shower over spa bath. Includes free multi device wifi. 1 x Queen Size Bed, ensuite with Breakfast making facilities. 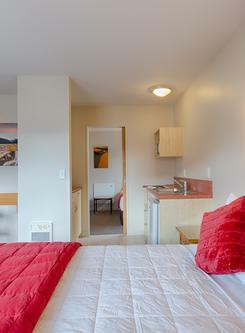 A studio with one Queen Size Bed, microwave kitchenette and either shower en suite or shower over spa bath. The studio includes a kitchenette which included cutlery and crockery, microwave and electric fry pan. Also there is a fridge, toaster, and complementary tea/coffee/hot chocolate, along with a hot water kettle. Ironing facilities, alarm clock / radio, LCD TV & DVD Player, electric heater, telephone and Free Multi Device Wi-fi is also provided. 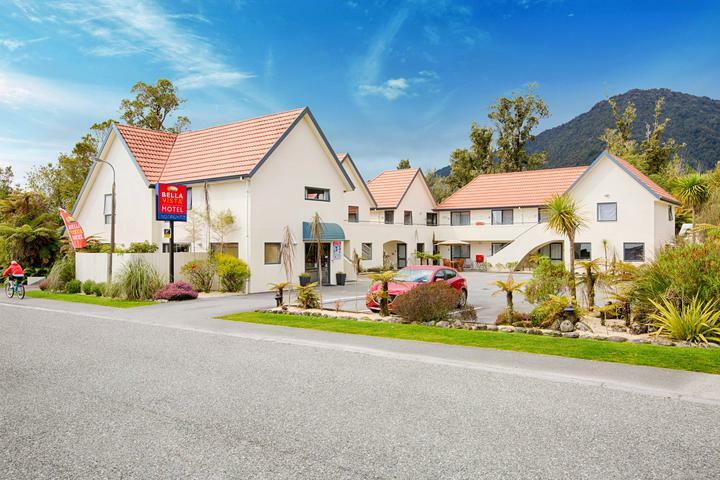 7 hours from Te Anau; 5.5 hours from Queesntown; 4 hours from Wanaka; 2 hours from Haast; 30 minutes from Fox Glacier. There is no cell phone coverage between Wanaka and Fox Glacier. 5 hours from Christchurch; 2 hours from Greymouth; (Tranz Alpine Train) 1.5 hours from Hokitika. There is limited cell phone coverage between Hokitika and Franz Josef Glacier. We are located on Cron Street. Once in the village turn on to either Wallace, Cowan or Condon Streets (towards the mountains.) These short roads will take you to Cron Street. We are located at 34 Cron Street. • Check out is by 10am • Free Multi Device WIFI • Guest Laundry • Complimentary towels for the hot pools, umbrellas, DVD’s. Fresh Milk is available from reception. • All Rooms are strictly Non Smoking. Payment via Visa / MasterCard incurs a 1.5% transaction fee. Amex incurs a 2% transaction fee. 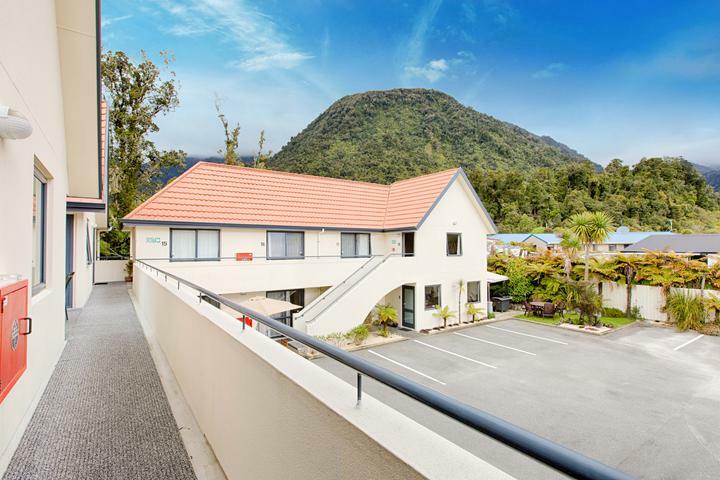 Cancellation/amendments must be made before 2pm 48 hrs prior to arrival or a charge of one night's accommodation will be made to your nominated credit card. Infants up to 2 years old are free if extra bedding / facilities are not required. Extra bedding used or the hire of a port a cot is an additional $20 per child per night. I accept for my credit card to be debited to cover all charges incurred by me, including replacement value for any damage and up to one nights tariff for smoking in my unit.